Happy New Year and welcome to 2019! If you have been following Baylor on social media you know that we are attempting to become what is called a Research 1 or R1 university, to become a Christian, research university. We have an academic strategic plan called Illuminate that provides the vision and direction for this significant work. The importance of this effort is going to have a meaningful impact on teaching and learning in ways that will influence our students with very positive outcomes. More students are coming to institutions of Higher Education wanting to gain research skills combined with strong learning and mentoring experiences. Presidents of universities in the US always discuss the significant benefits to students and faculty and the national recognition that comes when they become an R1 institution. Robbins College is advancing the mission of Illuminate through our own strategic plan. We have already increased the submission of proposals to granting agencies by approximately 400%. Additionally, we have been receiving prestigious federal awards all of which help advance Baylor’s goal of becoming an R1 institution. We also understand that some might think this would have a negative effect on teaching and learning. In my conversations, I began to realize the need to discuss how much research and the work of conducting research enhances a faculty member’s ability to mentor students and bring novel and new ideas to the classroom. Most of our work…community outreach, community research, writing for publication, conducting research in a lab, creative works to name a few…all of them, though considered research and scholarship, involve a significant amount of teaching and learning. Students are included in all aspects of answering our calling in and out of the classroom. Below is an image that helps demonstrate graphically how all of our work involves teaching and learning. Students being involved in research with faculty find that it brings a wonderful and fulfilling mentoring experience they remember for the rest of their lives. Students talk of professors discussing the latest research findings in their labs or in the community or in an approach to the design of a usable space that greatly enhances their learning in the classroom. 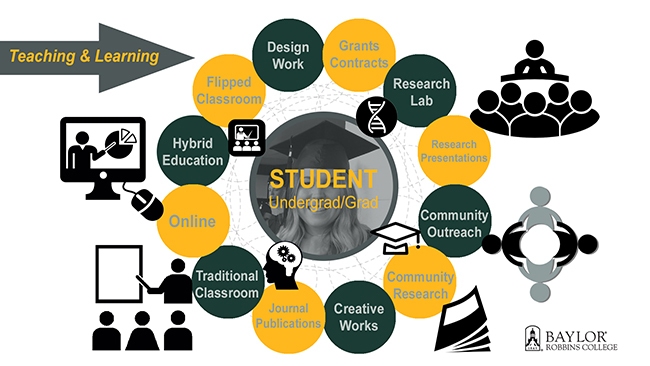 Below are examples of projects, ones that involve moving Baylor to an R1 status while advancing the academic reputation of Baylor and Robbins College. Yet, they also involve teaching and learning for our students that enhances our ability to prepare students for success post-graduation. I hope you enjoyed Christmas! Measuring hand grip can help identify youths who could benefit from lifestyle changes to improve health, Baylor researcher says — Adolescents with a strong hand grip — an indicator of overall muscle strength — have better odds of being healthy over time, according to a two-year study of 368 elementary school children. While other studies have shown that muscle weakness as measured by grip strength is a predictor of unhealthy outcomes — including cardiovascular and metabolic diseases, disability and even early mortality — this is the first to do so for adolescent health over time, a Baylor University researcher said. 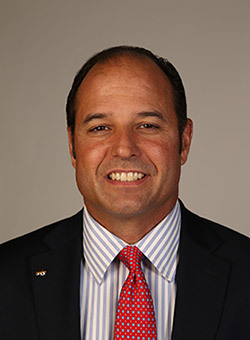 “What we know about today’s kids is that because of the prevalence of obesity, they are more at risk for developing pre-diabetes and cardiovascular disease than previous generations,” said senior author Paul M. Gordon, Ph.D., professor and chair of health, human performance and recreation in Baylor’s Robbins College of Health and Human Sciences. 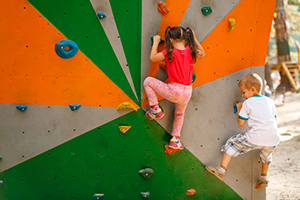 The study — The study — "Grip Strength is Associated with Longitudinal Health Maintenance and Improvement in Adolescents" — is published in The Journal of Pediatrics. It was conducted by researchers at Baylor University, the University of Michigan and the University of New England. Students tracked in the study were assessed in the fall of their fourth-grade year and at the end of the fifth grade. Using the norms for grip strengths in boys and girls, researchers measured the students’ grips in their dominant and non-dominant hands with an instrument called a handgrip dynamometer. Researchers found that initially, 27.9 percent of the boys and 20.1 percent of the girls were classified as weak. Over the course of the study, boys and girls with weak grips were more than three times as likely to decline in health or maintain poor health as those who were strong. Researchers also screened for and analyzed other metabolic risk factor indicators, including physical activity, cardiorespiratory fitness, body composition (the proportion of fat and fat-free mass), blood pressure, family history, fasting blood lipids and glucose levels. “Even after taking into account other factors like cardiorespiratory fitness, physical activity and lean body mass, we continue to see an independent association between grip strength and both cardiometabolic health maintenance and health improvements,” Gordon said. While much emphasis has been placed on the benefits of a nutritious diet and aerobic activity, this study suggests that greater emphasis needs to be placed on improving and maintaining muscular strength during adolescence. If someone with a strong grip develops an even stronger grip, “we don’t necessarily see a drastic improvement in that individual’s health,” Gordon noted. “It’s the low strength that puts you at risk. *An estimated 17.2 percent of U.S. children and adolescents aged 2 to 19 years are obese and another 16.2 percent are overweight, according to the National Center for Health Statistics. Excess weight carries a greater lifetime risk of diabetes and premature heart disease. While the World Health Organization and the U.S. Department of Health and Human Services recommend that youths perform at least 60 minutes of moderate to vigorous physical activity daily — including vigorous activity at least three days a week — fewer than a quarter of U.S. children do so, according to a report by the nonprofit National Physical Activity Plan Alliance. The data source was the Cardiovascular Health Intervention Program (CHIP), supported by a subcontract from the Children’s National Medical Center in Washington, D.C., which was funded from The Clark Charitable Foundation. Co-researchers were lead author Mark D. Peterson, Ph.D., assistant professor, University of Michigan Department of Physical Medicine and Rehabilitation in Ann Arbor, Michigan; Baylor graduate Sonja Smeding, B.S. (Biology), ’18; and Paul Visich, Ph.D., professor and chair, University of New England’s Department of Exercise and Sport Performance in Biddeford, Maine. Veterans with combat-related post-traumatic stress disorder were less anxious and depressed and had an improved quality of life after an eight-week therapeutic horseback riding program, according to a Baylor University study. “PTSD is difficult to treat. But those who went through the program reported lessening of symptoms and better mental health,” said lead author Beth A. Lanning, Ph.D., associate chair and associate professor of public health in Baylor’s Robbins College of Health and Human Sciences. The data revealed clinically significant improvements in depression and post-traumatic stress symptoms in the veterans who participated in the therapeutic riding program compared to those who did not participate. The finding is significant because 17 years after 9/11, combat-related PTSD in military service personnel remains a national public health concern, with estimates ranging from 2 to 17 percent in veterans. Mental health diagnoses among active duty military personnel have increased by 65 percent during the past decade, including adjustment disorders, depression, substance abuse, anxiety and PTSD, according to the Armed Forces Health Surveillance Center. Further, the U.S. Department of Veterans Affairs estimates that 20 veterans commit suicide every day. Requirements for participants included having served in any of the three Iraq and Afghanistan war missions; not having participated in any equine-assisted therapies or activities in the past 6 months; and having been diagnosed with PTSD. The study included 89 participants in two groups — one composed of 51 individuals who went through the horseback riding and one a comparison group of 38 veterans. Those in both groups were allowed to continue traditional therapy such as cognitive behavioral therapy and medications if already enrolled. A little more than half were attending a traditional psychotherapy program; 36 percent had completed a therapy program such as cognitive behavioral therapy. 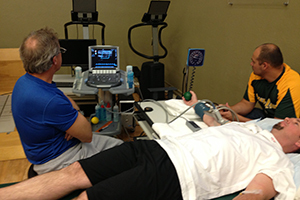 Participants completed self-assessments before the start of the study, at the mid-point, at the end of the treatment and at a two-month follow-up. Participants also named a person who knew them well, such as a significant other or family member, to complete an assessment of participants’ functioning at the beginning and end of the program. The therapeutic effects of equine-assisted interventions can be best summed up by the veterans’ own words, said Lanning, citing them. 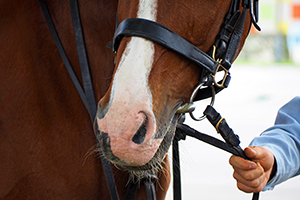 The study — “Therapeutic Horseback Riding as a Complementary Intervention for Military Service Members with PTSD” — is published in Human-Animal Interaction Bulletin. The study was approved by the university Institutional Review Board and the Institutional Animal Care and Use Committee. One arm of the study also was approved by Brook Army Medical Center Institutional Review Board. Co-researchers included Amelia L. Wilson of William Beaumont Army Medical Center in El Paso; Robert Woelk of Hope for Heroes Equine Therapy Consulting; and A. Alexander Beaujean, associate professor of psychology and neuroscience at Baylor. The study was funded by a grant from Horses and Humans Research Foundation and in-kind support by several therapeutic horseback riding programs. “Better sleep helped rather than harmed final exam performance, which is contrary to most college students’ perceptions that they have to sacrifice either studying or sleeping. 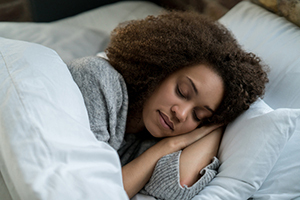 And you don’t have to be an ‘A’ student or have detailed education on sleep for this to work,” said Michael Scullin, Ph.D., , director of Baylor’s Sleep Neuroscience and Cognition Laboratory and assistant professor of psychology and neuroscience in Baylor’s College of Arts & Sciences. While students who successfully met the sleep challenge received extra points for the “mini-incentive,” the additional credit was not included in the analysis of how well they performed on the finals, emphasized Elise King, assistant professor of interior design in Baylor’s Robbins College of Health and Human Sciences. “They didn’t just perform well because they received extra points,” she said. “Students know that sacrificing sleep to complete school work is not a healthy choice, but they assume they don't have a choice, often remarking that there aren't enough hours in the day for coursework, extracurriculars, jobs, etc. The collaborative interior design study — “The 8-Hour Challenge: Incentivizing Sleep During End-of-Term Assessments” — was published in the Journal of Interior Design. Scullin’s study of psychology students — “The 8-Hour Sleep Challenge During Final Exams Week” — was published in Teaching of Psychology. The 24 who opted to take the challenge averaged 8.5 hours of sleep, with 17 meeting the goal. On the final exam, students who slept more than 8 hours nightly performed better than those who opted out or slept less than 7.9 hours. The incentive was 8 points — the equivalent of 1 percent on a student’s overall class grade. “It’s worth noting that one student who had a D-plus grade before the final but slept more than 8 hours a week during finals week, remarked that it was the ‘first time my brain worked while taking an exam,’” Scullin said. In the interior design study challenge, students earned credit if they averaged 8 or more hours a night but received no grade change if they averaged 7 to 7.9 hours a night. The 8‐hour challenge increased the percentage of 8‐ and 7‐hour sleepers to 59 percent and 86 percent respectively. Students who took part in the challenge slept an average of 98 minutes more per night compared to students who were not offered the incentive but were monitored. “Critically, the additional sleep did not come at a cost to project performance,” King said. “Students who showed more consistent sleep performed better than those who had less consistent sleep. And students who achieved the challenge performed as well as or better than those who did not take the challenge." She noted that there is a cultural acceptability — at least in design professions — related to sleep deprivation, in part because of the notion of the "tortured artist" who finds inspiration in the wee hours. Dr. Jeff Forsse, a recent graduate of the Kinesiology, Exercise Nutrition and Health Promotion doctoral program, led a team of researchers in Health, Human Performance and Recreation to study the influence of exercise on vascular and kidney health in individuals with chronic kidney disease (CKD). Low- and moderate-intensity exercise has many health benefits for reducing incidence and severity of several chronic diseases. In CKD, regularly-practiced exercise is known to improve cardiovascular fitness and help manage blood pressure, blood sugar and improve mental health. Dr. Forsse’s work is the first to show that only one session of exercise can improve blood vessel health and kidney function. The effects are only short term and last for up to an hour after finishing exercise. Dr. Forsse, mentored in his work by Drs. Peter Grandjean and Rodney Bowden, were able to demonstrate that improvements in vascular and renal health was equally as effective with brisk walking or by intermittent, high-intensity intervals as long as the exercise duration of 30 minutes was achieved. These researchers plan to build on these results by exploring the physiological basis for vascular and renal improvements and by determining if repeated exercise sessions on consecutive days adds to the observed benefits. Their ground-breaking findings contribute to our understanding of CKD progression and the dose-response relationship between exercise and health benefits in patients with chronic kidney disease. Their work will be presented at the international meeting of the American College of Sports Medicine meeting in Orlando, Florida this spring.